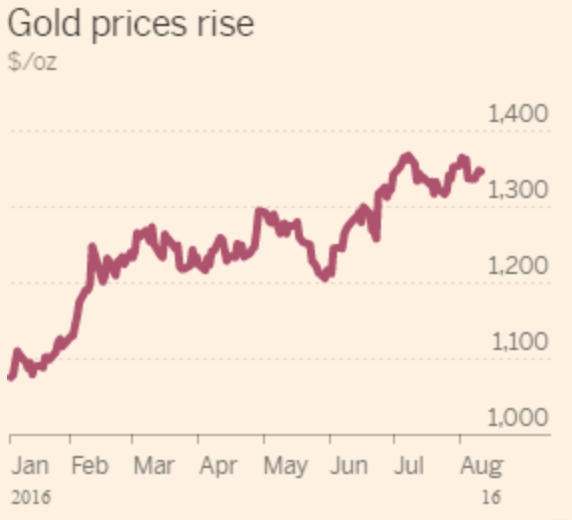 Is Down The Only Way For Gold Prices To Go in The Foreseeable Future? Gold prices since 2013. Source:MetalMiner analysis of @stockcharts.com data. Gold is the only commodity wherein physical annual demand is only a tiny fraction of total supply available and shortages of gold caused by physical demand never happen. Therefore, China’s demand growth for metals or the potential boost in U.S. infrastructure spending are factors that aren’t really helping push gold prices higher unlike industrial commodities. 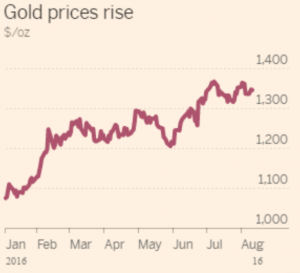 What’s causing gold prices fall dramatically? The U.S. dollar. As long as the dollar continues to rise, there is little hope for gold investors to make returns. Gold buyers should wait closely for weakness in the dollar before buying gold. For now, sentiment on the dollar continues to be quite bullish. A Trump win, which many believe leads to economic and global uncertainty, may also push the Federal Reserve to hold off from raising interest rates next month. Financial markets are beginning to believe the Federal Reserve is finally serious about increasing interest rates. At least, that’s the simplest explanation for rising treasury yields and the U.S. dollar index, which measures the greenback vs. a basket of major currencies, hitting the highest level in seven months. The U.S. dollar Index hits a seven-month high. Source: @stockcharts.com. While the Fed has repeatedly pronounced its intentions to raise rates, markets took those announcements with a grain of salt, pricing in a lower future rate than what the Fed was promising. However, since October, the 10-year Treasury yield has risen significantly as markets now see a 67% chance of a rate hike in the December meeting. Higher interest rates make the dollar more attractive to yield-seeking investors. Moreover, the dollar rose as most other major world currencies slid, particularly the British pound, which was depressed by Brexit concerns. A rising dollar has a negative impact on metal prices. Metals are priced in dollars and when the value of the dollar rises, it takes more more of them to buy metals. Another reason is that when the value of the dollar rises, foreign buyers have less buying power, typically causing demand for metals to shrink. Gold plunges as the dollar rises. Source: MetalMiner analysis of @StockCharts.com data. This is particularly true in the case of gold and something we mentioned in September. Recently, gold prices fell to a four-month low as the dollar rose. The dollar is not the only thing that moves metal prices but it is important. If the Fed raises rates this year that would likely strengthen the dollar, adding pressure to metal prices. On the other hand, if future Fed decisions disappoint, that would weaken the dollar, having a bullish effect on metal prices. The IMF has downgraded its U.S. growth outlook and Canada’s Goldcorp has been forced to shut down one of its largest mines in Mexico. The IMF on Tuesday cut its estimate for U.S. economic growth in 2016 to 1.6% from the 2.2% it had predicted in July. The American economy grew 2.6% in 2015. The fund’s dimmer outlook for the U.S. occurs even as the Federal Reserve is thought to be preparing to raise interest rates in December. The global economy will expand 3.1% this year, it said — the same as forecast in July. The IMF described worldwide growth as “subpar,” with a slowdown in the U.S. and other advanced economies being offset by slightly stronger output in developing and emerging nations. Goldcorp Inc. said on Monday it was temporarily shutting down its Peñasquito gold mine in Mexico as it was unable to safely continue operations due to a week-long blockade by a trucking contractor, sending its shares down nearly 5%. The world’s No. 3 gold miner by market value said it was unable to bring in food, water and fuel for the 750 people on the site, which has been blockaded by a contractor concerned about losing business due to efficiency improvements at the mine. India will complete the second phase of its mining auctions later this month, after the first round last year received a lukewarm response. Going under the hammer will be gold, diamond and iron ore mines. Mines in five provinces — Karnataka, Andhra Pradesh, Madhya Pradesh, Rajasthan and Jharkhand — will be auctioned. This time, there are 14 iron ore mines, 12 blocks of limestone and one block each of gold, diamond and copper. While some analysts have predicted a better response than last time to the iron ore mining auction, the limestone blocks may not see much action because of the cement market slump. In the first round of the auction, the states offered 47 mines bearing minerals such as gold, iron ore, bauxite and limestone. They were able to auction seven mines in that phase, earning the government billions of dollars over the next 50 years. However, 17 blocks were not sold due to an insufficient number of initial bids on account of factors such as quantity and grade of ore and low quality of the mineralization studies, among other reasons. The first round also came under scrutiny when the comptroller and auditor general of India (CAG), a body that audits all government expenditures, passed certain adverse observations. It said in a report tabled in the Indian Parliament that competition may have been restricted in the auction of 11 coal blocks on account of multiple bids by corporate groups made through joint ventures or subsidiaries. What Does This Mean For India’s Steel Exports? The iron ore auction comes at a time when the Indian government is contemplating a relaxation of export duties on iron ore. This has led to protests from the domestic steel industry. In a representation to the steel ministry, the Indian Steel Association asked the government to continue with a 30% export duty on all grades of ore, to preserve natural resources for domestic use. The government already cut the export duty on low-grade fines to 10% earlier this year but continued with a 30% levy on lumps. India’s ore production is lagging its growth of steel production. Production, according to steel ministry data, fell at a compound annual growth rate (CAGR) of 6.5% in the past five years. Tired of being an also ran? Having status symbols no better than the guy next door? Ever pulled up in your yacht only to find, 10 minutes later, a guy with a yacht twice the size pulls into the same bay right next to you? Yeah, tiresome isn’t it? Who Needs a Ferrari When You Can Have a Gold iPhone 7? Well, while everyone else is queueing outside an Apple store from midnight before the next morning release of a new smartphone, we have something so much better for you. 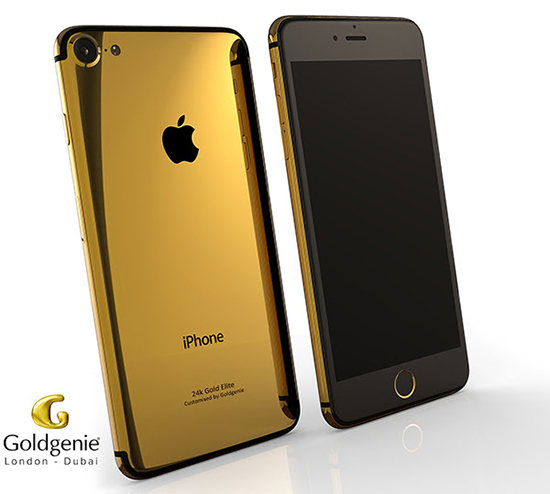 This is the new iPhone 7 from Goldgenie, finished in 24-karat Gold, Rose Gold or Platinum, and if that is not enough for you they do a super luxury version edged and decorated with Swarovski Crystals and even high-quality diamonds. Here’s the best bit, this exclusive, oh-so-cool, piece of one-upsmanship (if there is such a word) luxurious collection will be available with prices starting at just $3,150 (£2,400). Why buy a bigger yacht when you can have a 24-karat gold iPhone 7? Source: goldgenie.